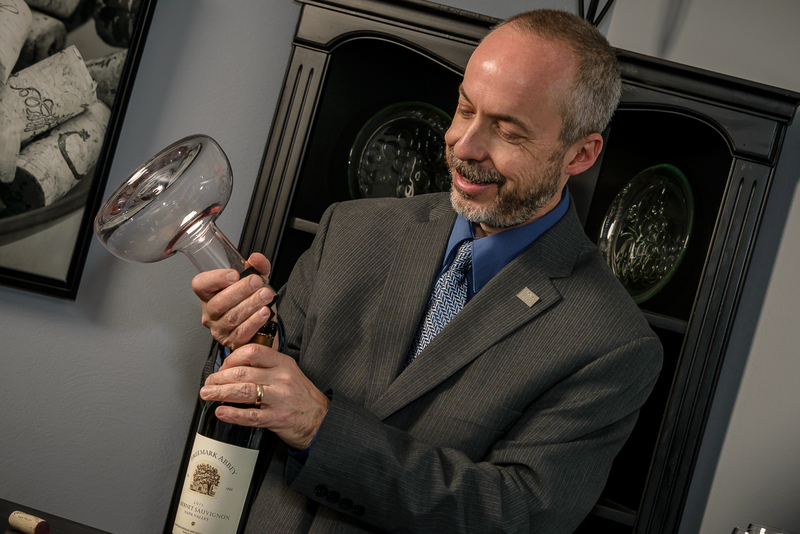 Mike Ward is a Certified Sommelier, Certified Specialist of Spirits, Certified Wine Educator and has successfully completed the Wine and Spirits Education Trust Level 2 Intermediate exam. Mike completed certification at the Napa Valley Wine Educators Academy. His passion and expertise have led him to become a member of the Society of Wine Educators. Mike began his career in the restaurant industry managing such establishments as Mike Duffy’s Pub and Grill, Remy’s Kitchen and Wine Bar and Cafe Eau and Eau Bistro in the St. Louis Chase Park Plaza. He also served as Director of Purchasing at The St. Louis Adam’s Mark Hotel and Food and Beverage Director at The River Port Doubletree Hotel. From early on, Mike had a fascination with and a passion for all things wine. This fascination and passion led him to his position as Missouri State Wine Educator for Major Brands, Inc. a distributorship in St. Louis. . I have been married to Mike Ward for over 25 years, and have seen him progress through the world of wine with determination, enthusiasm and hard work. He enjoys sharing his knowledge and love of wine with everyone. With a background in administration, it made perfect sense for me to join Mike in this endeavor in a “behind the scenes” role. I hope you enjoy Ward on Wine and be sure to check us out on Instagram, Twitter and Facebook, too! Leslie Gibson McCarthy believes most of the world’s problems can be discussed over a cup of coffee, and solved over a glass of wine. Since no one’s asking her to write about coffee beans, she is more than happy to lend her voice to Ward on Wine. McCarthy’s writing career spans over a quarter-century, from sportswriting to magazines to newspaper columns. She’s covered events from the White House to the World Series, and has interviewed everyone from Hall of Fame athletes to Hollywood actors to the neighbor next door. By day, she works in public relations for a world-class university; by night, she only hopes she’s aging as purposefully as wine. Read more at her website, www.lesliegmccarthy.com. For Ward on Wine, she’ll write about the experience of wine, from sharing a bottle with your best friends of 40 years, to sitting around with the family on a holiday, to that night a glass of wine turned a bad day at work into a relaxing night. Nancy is many things to many people – mother of six, wife, photographer, domestic goddess, problem solver, and whatever else happens to be required at any given time. Reid is the Co-Founder and Chief Operating Officer of Giant Hat (formerly Efeqdev). He lives in Maplewood with his beautiful and loving wife and spunky daughter. He is an avid coffee drinker and nerd and plays drums in the St. Louis rock-n-roll band Via Dove. Robin is a former bar owner, a skilled “craft” bartender, and an all-around booze and food geek. She is an active member of St. Louis U.S. Bartenders Guild and Bar Smarts Advanced Certified. She spent 13+ years behind the bar at St. Louis’ famed Absolutli Goosed as an owner and bartender creating over 200 of her own signature cocktails, educating with “Mixology” classes, and creating memorable experiences. You may have also seen her in the past at Remy’s Kitchen & Wine Bar, Tani Sushi Bistro, the Fox Theater, and maybe even a private event or competition in St. Louis or New Orleans. You can currently find her at The Wine Barrel in Sunset Hills, MO. Robin loves to travel and often combines her passions by visiting breweries, distilleries, and wineries in new locations. She also takes great pride in being a wife and mother.